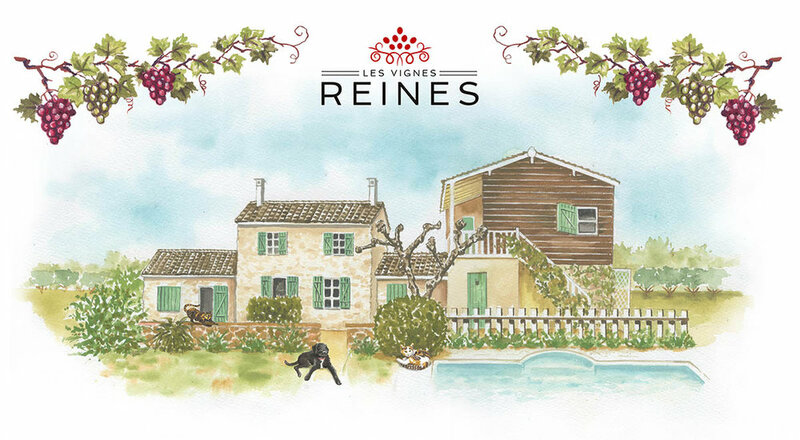 I recently had the pleasure of painting this lovely B & B called Les Vignes Reines. It is nestled in the heart of the Bordeaux region of France and run by 2 amazing women Elin and Ophèlie along with their canine and feline assistants. The painting was to be used for their business cards and general branding and promotion. The tranquility of the place, to me, begged to be painted in watercolor, a medium I usually reserve for my travel sketches and I feel it conveyed perfectly the lightness perfectly. It was a dreamy project for sure but not without its challenges: mainly the difficulty of obtaining photos of the entire house due to a pesky line of lovely trees and bushes along the back behind the pool. In the end I had Elin shoot a series of straight on photos which I had to put together side by side, in the style of David Hockney's Polaroid compositions to try to get the proportions and scale correctly! It was a wonderful assignment and I look forward to visiting soon and doing more watercolors in person while sampling some of the local wines!